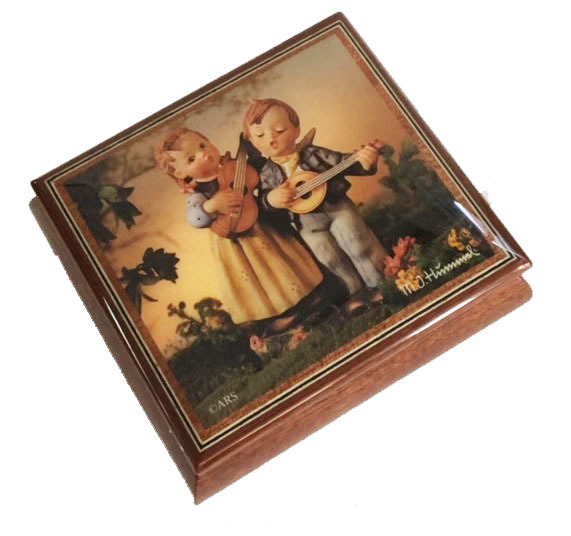 A Music box for the Hummel Collector! Decoupage on lid of Hummel's well known "Happy Days." By Ercolano, this sweet box measures 5" x 4 1/2" x 2.75" and plays "Raindrops keep falling on My Head." A little girl sings plays her guitar while a little boy sings and plays his mandolin. You may select a different tune from our 1.18 note TUNE SELECTOR when you add to cart.